DIVERTING feeder cattle from 100-day export programs to 70-day domestic short-feeding is one strategy being explored by some commercial lotfeeders, who this year are facing a growing shortage of heavier feeder cattle due to drought. The trend is particularly evident in southern lotfeeding regions, where the decision has been forced by deteriorating conditions, and huge – perhaps unprecedented – pricing gaps between lighter and heavier feeder cattle. There are some important differences between 2017 and 2018 in procurement strategies open to lotfeeders. Both were dry years, but the big difference was that last year, feedgrain prices were considerably lower than current record levels. Last year, lighter cattle were more expensive than heavier feeders, but it made more sense to buy them, because the cost-of-gain in the feedlot was considerably cheaper than the c/kg purchase price of the animal itself. Roll forward to 2018, and circumstances could not be more different. 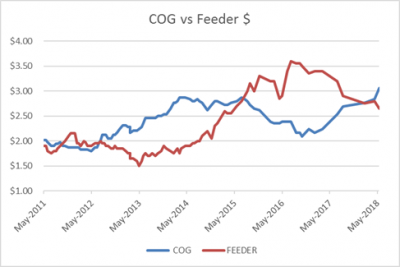 Lighter feeders are considerably cheaper than the (increasingly scarce) heavy feeders, but feedgrain prices at record levels provide no financial incentive to buy those lighter animals and feed them on. Feedgrain prices – currently around $400/t in northern lotfeeding areas, and around $370-$380/t further south, have added layers of complexity to the equation this year. As can be seen in the attached graph, produced for Beef Central’s regular 100-day breakeven report, cost of gain on heavy feeders is now above animal procurement c/kg cost, for the first time in around three years. It’s made feeding lighter cattle on to target weights for export markets prohibitive, in some cases. Last year, the shortage of heavy feeders caused by the two preceding drought years of herd liquidation meant lighter cattle came into the equation, driven hard by the fact that feedgrains were still cheap enough to justify doing it. In most years, there’s a heavy feeder supply squeeze in southern Australia around July-August, but this year it’s come months early, and is far more intense than normal, due to the drought. One large NSW lotfeeding contact told Beef Central yesterday that heavy feeders in his region currently had a basis premium of perhaps 40c/kg over lighter lines of cattle – an unprecedented gap, in his opinion. He priced heavy Angus feeders 440kg in central NSW this week at 315-320c/kg, while a 260kg Angus steer was struggling to make 280c/kg liveweight. “Despite very expensive grain and ration prices, market dynamics are such that heavy feeders have got dearer, because of severe lack of supply,” he said. “In the absence of availability of better heavy feeders, feeding those lighter cattle on for longer periods is a real conundrum. Not only have we got dear grain, but every available feedstuff has got dearer, from hay to cottonseed to meals. This time last year we could buy those lighter cattle and feed them longer, because it made financial sense to. This year, that does not apply,” he said. The contact said there was ‘no doubt’ that more young cattle in southern Australia destined for lotfeeding programs would be diverted into 70-day yearling domestic programs, rather than feeding on to heavier export weights at greater cost. A large multi-site feedlot operator said another problem caused by the current shortage of heavy feeders was that it compounded slaughter supply consistency issues later in the year. “Under the current conditions, it’s easy to fall short of expected numbers of export grainfed cattle in 120 days’ time, unless it is managed right,” he said. “For example, for a processor inducting, say, 5000 steers this week into 100-day programs, if a quarter of them are light cattle, that leaves that processor short by 1250 bullocks in the week when they should be ready to go,” he said. He said the further south you went, the bigger the feeder weight problem became this year. The contact estimated that feeding an under-weight feeder to a grainfed Jap ox spec could this year easily cost three quarters of a tonne of extra finisher ration, per beast. “With dear grain, it’s costing a fortune,” he said. At current custom-feeding ration prices of around $410/t, that could cost around $300/head. The contact said his business had a similar challenge last year, buying a lot of light cattle as part of its feeder procurement strategy. While he could see some logic in shifting some young cattle from 100-day programs into 70 days from an operational sense, he said the problem was that most large grainfed beef supply chains were locked-in to long-term contracts with international for a certain volume of 100-day grainfed beef, under brand programs. “It’s not like turning on or off a tap. We have commitments for 100-day cattle,” he said. Another southern feedlot operator spoken to yesterday, who has lowered minimum intake weights this year on 100-day cattle from 350kg to 330kg, said a factor in considerations about feeding-on lighter cattle in a year like this was better feed conversion and compensatory gain in cattle due to the conditions. Grain prices in southern regions continue to creep north. This lotfeeder contact quoted wheat/barley delivered Forbes this week at around $370/t. He said an added demand-side factor this year, given the extreme high prices in the market for lamb, was the volume of grain now being diverted into lamb lotfeeding or supplementation programs, that might otherwise have been absorbed by cattle feeders. Both are due for approval by the AusMeat Language and Standards committee sometime around September this year. In commentary this week, MLA reported Darling Downs feed wheat up $62/t since the beginning of April – a rise of 19pc. Across Australia’s grain belt, prospects for the winter cropping season were declining by the week, with no strong indication from the Bureau of Meteorology that rain is on the horizon. “Looking to international production, dry conditions across key grain-producing states in the US are expected to weigh on crop yields. According to the latest USDA forecast, the 2018 US wheat crop will reach 1.19 billion bushels, down 6pc year-on-year – which is the smallest harvest since 2002. After a record crop in 2017, Russian wheat production is expected to fall in 2018 on the back of challenging growing conditions,” MLA said. Feed grain prices became increasingly relevant to Australian livestock markets in dry times. As pasture availability declines along with restocker demand, producers look to the growing lot-feeding sector to absorb any excess supply of livestock, MLA said. Cattle on feed exceeded one million head for the first time in the March quarter 2017, which was again the case in March 2018 despite significantly higher feed grain prices. During the March quarter 2017, Darling Downs wheat averaged $234/t, compared to $329/t in the March quarter 2018 – representing an increase of 40pc. Since the beginning of April, processor demand for grainfed cattle had held firm, reflecting strong demand for grainfed beef in key export markets. This demand continues to support numbers on feed in the face of rising feed grain prices. As of 21 May, the QLD 100-day grainfed steer OTH indicator sat at 520¢/kg carcase weight, up 4pc since 1 January.